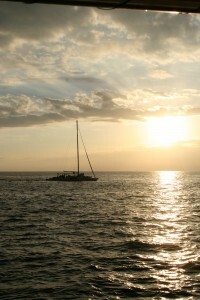 May 2013 - Latitudes Adventure Tours Costa Rica | Travel. Inspired. If you’re an adventurer at heart, then you know that every vacation is a balancing act that involves getting as much awesome packed into your trip, and minimizing all the boring stuff – like sleep. Your time is limited, so you need to make the most of it. 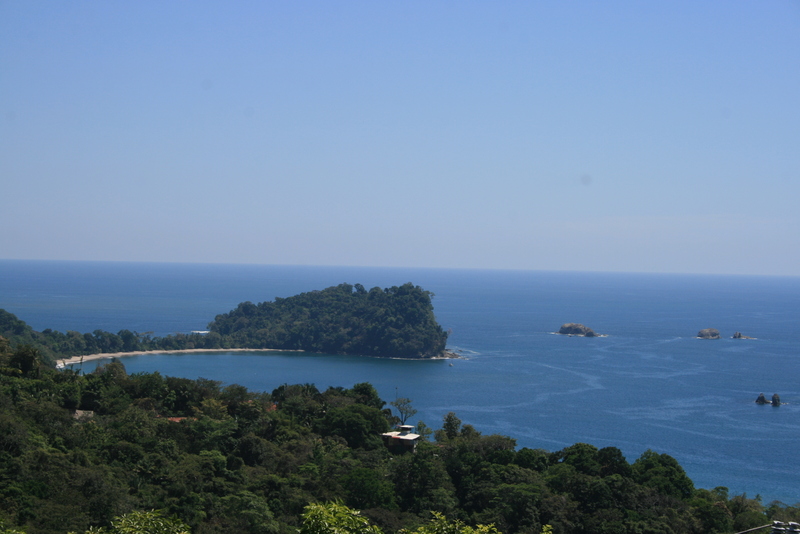 One can’t-miss stop in Costa Rica is Quepos. This gem is your springboard to some of the most in-demand activities set in some of the most beautiful surroundings you’ll ever lay eyes on. Grab a guided tour with Rancho Los Tucanas. You’ll find telescopes nearby to spot exotic wildlife on the trails and in the canopy. And if you don’t spot anything at first, your guides are wildlife spotting ninjas! Couldn’t see that sloth hiding 200 meters away underneath the brush? Your guides just caught it in the sights for you. 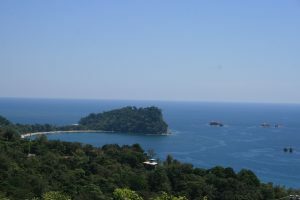 Manuel Antonio also has what is considered by locals to be the most beautiful beach in Costa Rica, mostly because it only ever has a handful of tourists on it at any given time. Bring a towel and expect to be in the greeny-blue water until you’re as wrinkly as a raisin. If you’ve been on the run all day, you might be getting a bit peckish by mid-afternoon. Our tour company doesn’t miss a beat, and has a full fruit and juice picnic ready for you by the time you exit the park. Fresh pineapple and watermelon tastes SO GOOD after a long hike in the heat of the day. This is a great time to relax, decompress, and talk about all the amazing things we saw that day. After a good hike, nothing beats diving into the ocean off a catamaran. The voyage starts in Quepos Marina as you board a boat with around 50 other people. The plan for the trip is to snorkel, spot some dolphins, eat a massive meal with beer and wine and then watch the sunset. The catamaran trip does not disappoint. You start by anchoring near a reef to snorkel and see colourful fish. It’s not uncommon for first-timers to be sceptical about how many fish you’ll see when you and forty-nine others hop into the water, but the fish don’t disappoint in Costa Rica either. They swim through your fingers, touch your mask and tickle your toes. This really could be the highlight of your trip. And once you are done becoming one with the fish, you can hit the catamaran slide to awake your inner nine-year-old. Next, the captain took us looking for flying fish and the booby, a common species of bird that trails dolphins as they both are attracted to the same lunch. Once we found them, the scene was unbelievable. The flying fish are popping out of the water like oil from a hot pan, getting picked out of the air by dolphins from below and booby birds from above. Un-be-lievable. Then, just as the sun was setting a massive meal was served. Grabbing a spot on the mesh hammock at the front of the boat is a luxury, so getting up there early is key. 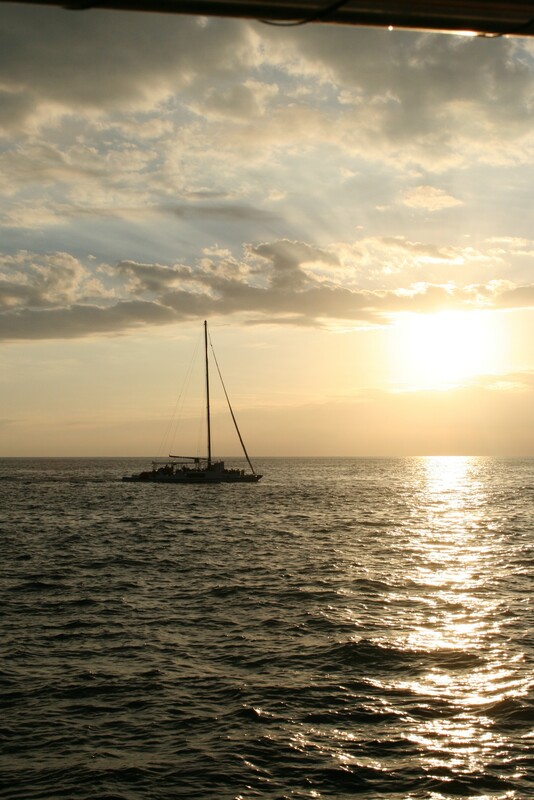 You’ll feel like you’ve got the entire boat to yourself to watch the sun set on the ocean horizon. It’s the perfect finish to a day that you’ll wish would never end. This entry was posted in Uncategorized on May 28, 2013 by Geoff Brewer.